Chinese cooking styles draw on local and easily available ingredients so for the two most famous cuisines Szechwan and Cantonese, the distinction is strong - Szechwanese cuisine uses spicy dishes because chilli paste, red peppers and spiced oil are all readily to hand – this means that the Szechwanese are famous for hot chilli eggplant, Szechwan Beef and Kung Pau Chicken. On the other hand, Cantonese cuisine draws on Canton’s history as one of China’s longest established international ports to create dishes using beef as well as the more commonplace pork and chicken, but also incorporating organ meats, chicken and duck feet, duck and duck tongues, fish, snakes, and even edible snails. Traditionally, Cantonese cooking uses spices very modestly and prefers to focus on the flavours of the primary ingredients. There are strong cultural beliefs underpinning a lot of Chinese cooking, which require the cook to consider the balance of positive and negative energy in the dish. This is the Yin/Yang balance. Yin foods have negative energy and Yang foods carry positive energy and if they are not well balanced in the individual, the person risks developing confusion and disease. Obviously, what is eaten has a direct effect on the balance of Yin/Yang in the body. Yin foods are ‘cold’ foods such as Chinese greens like Pak Cho, mustard greens and watercress, cucumbers bean sprouts, mung and soya beans, water chestnuts, coriander (both seeds and leaves) watermelon, bananas, coconut, and most light-coloured shellfish such as clams, and oysters. Yang or ‘hot foods are chilli garlic, onions, aubergines, pineapples and most ‘bright coloured’ fruits such as mangoes and cherries, beef and turkey and bright coloured shellfish such as prawns and crabmeat. These two food groups should be balanced evenly, across either a single dish or the dishes that comprise a whole meal. There is a Chinese saying that ‘one eats with the eyes first’ and for Chinese cuisine to appear authentic, you need to pay particular attention to how food is presented – it should contain a range of textures and colours as well as flavours. Usually, for Chinese food, vegetables and meat for an individual dish are cut into equal sized pieces, which may be slices, chunks, long strips or dice. It’s traditional for the food to be prepared so that each piece is bite sized so that it can be taken directly from the communal plate and eaten. Cutting food on a plate before transferring it to your mouth is very unusual in Chinese cooking. Stir-frying – To stir-fry vegetables, cut them to similarly sized pieces and then fry the most dense textures for longer than the leafy or watery vegetables. It is quite common to cook meat first, then remove it from the wok and add it again near the end of the cooking time. Use oils that can cope with a high temperature like light sesame, corn and sunflower oils. For this cooking system you need to ensure you’ve prepared all the ingredients before beginning to cook, as it’s a very fast cooking technique and stopping part way through to do preparation can ruin the entire dish. 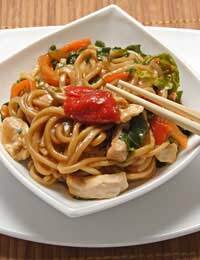 Cooking with noodles – Chinese noodles come in a very wide range of sizes and shapes. This allows them to be cooking in a soup, or stir-fried, when they are known as chow mien. It is traditional to serve noodles at a birthday dinner and then, the longer the noodle, the longer the life-span of the person who’s birthday it is, so don’t cut them shorter before cooking! Making a Banquet – even for simple family meals, a Chinese cook will make a range of dishes including rice, which should be served with every meal, soup – which is set in the middle of the table, a noodle dish, one or two vegetable dish and often dumplings. Allow people to serve themselves from the range of dishes you are offering.